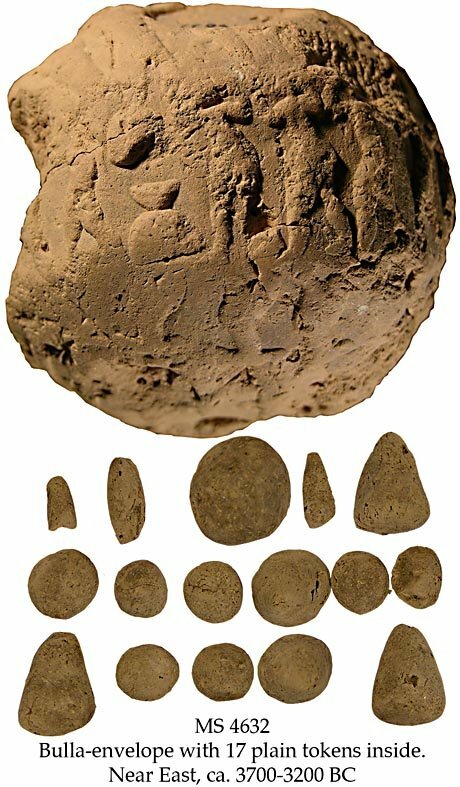 Description	 Bulla in clay, Syria/Sumer/Highland Iran, ca. 3700-3200 BC, 1 spherical bulla-envelope (complete), diam. ca. 7 cm, cylinder seal impressions of a row of men each carrying a sack on his head towards a large cauldron placed on a rounded stand; and of a line of tall ringstaffs and men; a 3rd impression of a large disk type token or the bottom of a large cone, diam. 2,2 cm, possibly representing the total sum of the complete set of plain tokens inside: 1 sphere diam. 1,5 cm (D.S.-B.2:2), 8 small spheres diam. 0,8 cm of which 1 still sticks to the inside of the bulla (D.S.-B.2:1), 5 cones diam.1,0x1,5 cm (D.S.-B.1:1), 3 small cylinders diam. 0,4xca.1,2 cm (D.S.-B.4:1). Context	 Only 25 more bulla-envelopes are known from Sumer, all excavated in Uruk. Total number of bulla-envelopes worldwide is ca. 165 intact and 70 fragmentary. 17 tokens is the largest number found inside a bulla-envelope. While counting for stocktaking purposes started ca. 8000 BC using plain tokens of the type here, more complex accounting and recording of agreements started about 3700 BC using 2 systems: a) a string of complex tokens with the ends locked into a massive rollsealed clay bulla (see MS 4523), and b) the present system with the tokens enclosed inside a hollow bulla-shaped rollsealed envelope, sometimes with marks on the outside representing the hidden contents. The bulla-envelope had to be broken to check the contents hence the very few surviving intact bulla- envelopes. This complicated system was superseded around 3500-3200 BC by counting tablets giving birth to the actual recording in writing, of various number systems (see MSS 3007 and 4647), and around 3300-3200 BC the beginning of pictographic writing (see MSS 2963 and 4551). Published	 Jöran Friberg: A remarkable Collection of Babylonian Mathematical Texts. Springer 2007. Sources and Studies in the History of Mathematics and Physical Sciences. Manuscripts in the Schøyen Collection, vol. 6, Cuneiform Texts I. p. 384.